How do I find my Team Name in all of these templates? The fastest way to navigate through our templates is to use the Search box at the top right of the website. Type in the team name you are looking for & hit “Search”. Scroll down to the “Team Name Search” below the Search box or scroll further down and see any templates you can start with. If you are the Red Gummi Bears put “Bears” in the search bar. You can change any templates you find to your exact team name. I did a Team Name search on your website – how do I pick from all those names – it’s overwhelming? Try to have some ideas before you sit down to search. Discuss with your players and parents what name they want. Often team names are based on team color – Blue Dolphins, Blue Sharks, Blue Tornadoes. Any name can be adapted to add the team color to it – so scroll through the “Team Name Search” to see if something jumps out at you. What if I can’t find my team name when I search? Every part of our existing templates can be changed – Team name, backgrounds, art, player art, text, colors! You can choose any template to get started or you can find something that might adapt to a name you’ve already chosen. Example: “Slime Time” can be used for “The Drippy Noses”. Don’t forget…you can start with ANY template and change it to suit your name/needs. Do I receive player posters automatically with my team banner or pennant order? Yes they do at no additional charge. Each named player on the team will get a free 11 x 17 paper poster as a keepsake to remember their season by. Additional posters are also available for purchase when ordering, for parents, grandparents, etc. if they may desire them. What’s the fastest way to get a Team Banner done? I need this thing in my hands by this Friday? Place your order as soon as you have all your team information. For California, Arizona, and Nevada delivery with no additional cost, place your order by noon on Wednesday to receive same Friday. If you are ordering from any other contiguous state please place your order by midnight Sunday to arrive by Friday. If you have to order later than those days, we do have Rush Options and Upgraded Shipping available. Why do banners for different sports show when I search for names? Yes, Baseball Season and Soccer Season results do show when you do a search. We haven’t broken that barrier yet. What is the difference between vinyl and fabric banners and why do I need to make a choice? Fabric is non-reflective in photos. However, the only solution to fix or add a player is to reprint the banner. We do offer a reduced re-print price. Our Vinyl has a matte, low sheen finish that looks great and works well for photos. We offer a sticker solution for adding/fixing players to vinyl banners. Help! I designed by banner as fabric, but I want vinyl. What should I do next? Don't worry, this happens often. Just go ahead and place your banner order as a fabric banner. Then the minute you see your order number on the screen, you will be sent a confirmation email (check your SPAM/Junk folder). IMMEDIATELY reply to that confirmation email that you want a vinyl banner. We will reply in writing, and we will refund the difference..
Why should I want to use the Live Designer? The Live Designer is the least expensive way to get your banner from us. Even better, using our Designer gives you a chance to let your creative side out. Plus – you decide where you want everything! 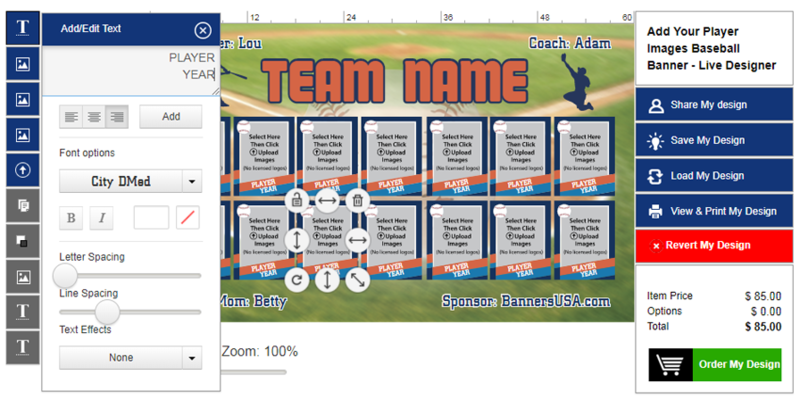 Play with any of the templates before starting to make your team banner. You can email your designs to the team before you purchase. Using the Live Designer is a lot of fun! What do I need to know about using the Live Designer? This thing looks a little overwhelming. Don’t be worried. Once you’ve played with it you’ll find it’s fun and easy to use. The best place to start is by clicking on any template and watching the “Live Designer – How to create a Soccer Banner” video above the template you chose. This has plenty of information to get you started. What is this thing you call the Live Designer? The Live Designer is BannersUSA’s easy and fun to use online custom design tool. It’s kind of like a mini graphic arts program you can use on any web connected device. BannersUSA wanted to give team parents an easy way to have choices so their kid’s team could have their best banner ever. The Live Designer is built with a wide variety of backgrounds, art, and team names so that a banner can be unique every time. We have to admit that a lot of teams use our templates as we made them, simply changing names and colors to work for their team. This makes our template designers feel very proud of their work! How long does it take to design a Team Banner using the Live Designer? 1. Before you commit to a template be sure to open any template and PLAY with it. You can’t break it! 2. Clear your computer’s cache. Information stores up on your computer and can slow down everything. See Help&FAQ’s at the bottom of our home page to learn how to clear your cache. If you are on your phone or tablet – do a complete shutdown, then restart. 3. Get the names of all the players (and anyone else you want on your banner) on a Word document or Notepad or in an email – something you can copy/paste from. Verify before you start that all the names are spelled correctly. Have that open when you’re ready to start. 4. Save your file regularly once you’ve started your actual banner. Be sure to name your banner as something you can go back to – saving with the same name overwrites the previous save. So, save as: Strikers 1, then Strikers 2. This way you can go back to an earlier design if you want to. 5. Use the “Undo” and “Redo” buttons if you want to correct something that just happened. For instance, say you deleted ALL the players with their accessories and now you don’t have one to start with. Simply click on “Undo” – the last player deleted is back to work with. 6. Before you check out: Email it to yourself, then to other team members to verify spelling. The saved file you check out with is your final proof. 7. Please use the same email address to save your banner as you will be checking out with. This will help us if we need to find your file on our side. If you use a different address and call us with questions, please give us the email address you saved under. This will save time when we help you. Are there other ways to order a Team Banner besides using the Live Designer? We have two other options for ordering banners. We have the EZ Order choice – choose one of the templates from EZ Order, fill in the information – verifying spelling – and place your order. We will use your information to make the selected template into your banner, then print it and ship it. We will keep the placement as close to the original template as we can when adding your team info. If you want a proof, there is an upgrade option for that. The Custom Order process lets you choose the parts you want to use; give us all the team information and details and place your order. We will create one proof for you to approve. Once approved, your banner is printed and shipped. This option will take a little bit longer because we will wait for your approval before going to print, so it’s not the fastest choice. I have a team banner design that I created, how should I handle it? In order to give you our best pricing, we have specific instructions on how to save your file so it will be easy for you to send to us and will print properly. Hi, I found one of your banners when I searched online, but I can't find the same one on your website, what should I do? All of our banners on Pinterest were created using our Live Designer templates. So, to create one just like the one you found, look through our templates and find the one that most closely matches the one you found. Then, use our Live Designer module to change that template to match the one you found. Our Live Designer is our online tool that lets you completely change any of our pre-made templates. Ordering on Sunday guarantees you’ll have your banner by that Friday if you are in any of the 50 contiguous states. You can also take advantage of the Sunday Discount Code we email out each week. What about changes to the banner after I receive it? Vinyl Banner = Go to the bottom of any page and click on Add/Change A Name. Fabric Banner = Go to the bottom of any page and click on Special Fees. Scroll to “Team Banner Reprint” and click on it. Multiple Add-Ons/Fixes = Go to the bottom of any page and click on Special Fees. Scroll to “Team Banner Reprint” and click on it. How long is it going to take to get this banner to my house? CA-AZ-NV: Order by noon on any Wednesday and receive that Friday without upgraded shipping or rush fees. Other States, excluding Alaska and Hawaii: Order by Midnight any Sunday and receive that Friday without upgraded shipping or rush fees. Our SMARTship option is our simple, easy, and flat rate shipping option that guarantees your team banner will be on time for that first game or picture day. As long as you meet the deadlines below, we will get your banner to you on "that Friday" with no extra rush fees or expedited shipping charges. CA-AZ-NV: Place your Live Designer or E-Z team banner or pennants order by Wednesday at noon, no additional shipping or fees are required to get it by that Friday. Other States, excluding Alaska and Hawaii: Place your Live Designer or E-Z team banner or pennants order by Sunday at midnight, no additional shipping or fees are required to get it by that Friday. What’s up with this new Easy Banner Stand? The new banner stand is way easier and faster to set up and take down. It has less pieces to keep track of (or to lose). It also weights less than 3 pounds! How can I take a team picture with this new Easy Banner Stand? 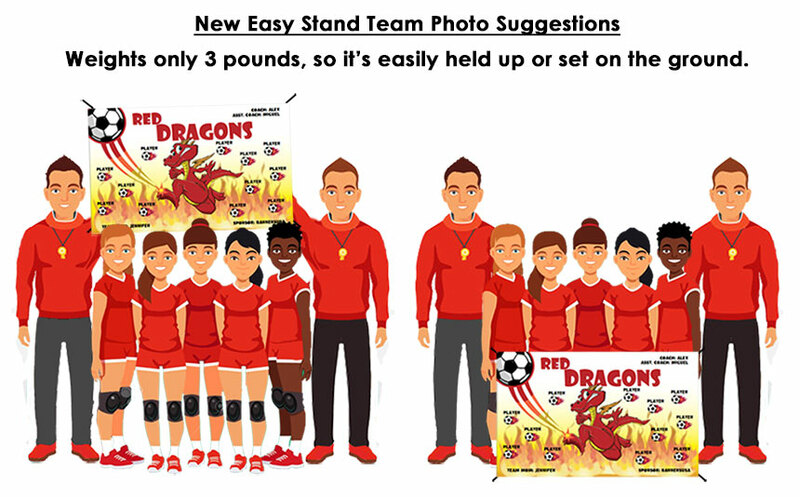 Since the Easy Stand weights less than 3 pounds, it can easily be held up behind the team players or set on the ground in front. My new Easy Stands back leg broke, how can it be fixed? Sometimes, if not handled properly, it could break. If this did happen to you, please e-mail us at teamsales@bannersusa.com and request the replacement part "Back Leg Fix". We will send out a new one, at no cost to you, via USPS. Once you receive it, you can refer to the video below and how to install it properly. Does my team banner or pennants order come with grommets? Yes, each 5 x 3 soccer team banner comes with 4 grommets one in each corner. Baseball and softball 5 x 3 team banners come with 5 grommets and 5 clips to hang on a fence. Each player or team pennant comes with 3 grommets and 2 clips to hang on a fence. WE DELIVER! We get your great banners and flags to you in time for your weekend events.Our Live Customer Service (the BEST in the industry) is available to help you get a banner or flag you and your team can be proud of. Let us use our 20+ years of experience to help your team stand out on the field. How do I choose a Team Banner Company to use and why? Choose a Team Banner Company that has a proven track record. BannersUSA has been creating great banners for over 20 years and getting them to our customers in time for their events. Choose a Team Banner Company that has Live Customer Service available to help you. BannersUSA is available 8am to 4pm M-F…extended hours during Baseball and Soccer Seasons. Does BannersUSA do anything else besides Team Banners? Yes! We do Banners, Flags, Pennants, Corner Flags, Field Markers, Registration Banners, Sponsor Banners, A Frames, Yard Signs, and many more “Field” products. We also do Event Backdrops, Table Covers & Table Runners. We’re not “just a banner company”. Yes! But only if you email us RIGHT AWAY. We process orders as soon as we get them, even on the weekends (especially during our busy times). So, if you have to change your original order, email us IMMEDIATELY and we’ll email you back and let you know if we can catch your order before it prints. It looks like you may be experiencing some problems with our website. It's possible that your browser's saved version (cookies, cache, etc.) has a glitch that is preventing it from working. Usually, this happens when you’ve walked away from the site, forgot it was up, then when returning it looked fine. But, most likely it had timed out. It fails to work then. Here is what we suggest: We prefer (and recommend) the Chrome browser on Windows 10 with a wired network connection for using our site. Whichever browser, device, operating system or type of connection you're using, if you haven't cleared your browser's history recently, now would be a good time. There may be memory of the issue which will continue on, sometimes across devices. When you clear your history it's the cookies and the cached images that you'll want to clear. Be sure not to clear your passwords or auto-fill entries. Then, start from scratch. Close and reopen your browser, and maybe even restart your device. Then, begin from the original template. Save occasionally, every five or ten minutes or so. If you want to keep each saved version, just number them - ex: Tsunami 1, Tsunami 2, etc. This should clear up your problems. The photo banner templates are a bit complex and utilize just about all of our website server’s and your browser's resources. So, when you're making one, please use the Chrome browser and a wired network connection. Also, close all other open apps on your PC and any other open tabs in your browser. You and your PC are going to need to focus on this task. If you haven’t recently cleared your browser’s cookies and cache, now is a good time to do so. And, once you’ve started working on your banner, occasionally save your work. Don’t leave your PC without saving your design and closing the browser. For security reasons, the Live Designer will time out in your absence and you will most likely corrupt your file and lose all of your hard work. HINT:You can click on the next frame without closing the tab to enter the remaining names. Once that's done, SAVE YOUR DESIGN. Now, edit the team name and other text, SAVE YOUR DESIGN. Now it's time for your photos. Make sure they're not too big or too small. The size of your cropped and resized photos is VERY IMPORTANT. If they’re too small, we can’t print them and if they’re too big your file won’t be able to transfer over the internet. You will need to crop and resize all of your photos before uploading. That's really the most tedious part. It can be done efficiently with Photoshop (there's a free trial download available). There are also free online editors. One that other customers have used is at Resize Image.net. Be careful to maintain proportions and not stretch your photos taller, thinner or wider, the faces will look distorted. Sure. . . you can upload your photos without cropping and resizing, the Live Designer will let you, but you're gonna have a difficult time. So make it easier on yourself. For the rectangular frames, the final output size is about 6" x 7.5" which translates to a minimum of 432 pixels wide by 540 pixels tall. We don’t recommend anything larger than 600 pixels wide by 750 pixels tall. For the round ball frames, the final output size is about 5.75” x 5” which translates to a minimum of 414 pixels wide by 360 pixels tall. We don’t recommend anything larger than 575 pixels wide by 500 pixels tall. Once you've cropped and saved them all, upload each one into its frame. SAVE YOUR DESIGN. Then, you'll be ready to check out. You will need to crop and resize all of your photos before uploading. That's really the most tedious part. It can be done efficiently with Photoshop (there's a free trial download available). There are also free online editors. One that other customers have used is at Resize Image.net. Be careful to maintain proportions and not stretch your photos taller, thinner or wider, the faces will look distorted. For the round ball frames, the final output size is about 5.75” x 5” which translates to a minimum of 414 pixels wide by 360 pixels tall. We don’t recommend anything larger than 575 pixels wide by 500 pixels tall. Once you've cropped and saved them all, upload each one to their matching player names. HINT: Be sure to name your images with each players name, that way it's easy for you and us to correctly identify who goes with what image. Then, you'll be ready to check out. Don’t worry, we’ll get you taken care of. Most importantly, we’ll make sure to get your order to you on time. Please don’t spend too much time trying to fix it on your end, we may have a speedy solution. Just email us with the important details of your problems on the site and we’ll get back to you right away. If you prefer to text, please include your phone number in your email and we’ll switch to texting you. We prefer email, because we can check it remotely even when we’re closed. Once, again, don’t worry. . . We take good care of our customers. And, thank you for your patience!. Click on the text, click copy then click paste. Click on Add/Edit Text and make your changes. Drag the player number onto the corresponding ball. Copy and paste the first number and change it to the next player’s number. Drag the player number on the corresponding ball. Repeat until you’re all done. Department will adjust if necessary.